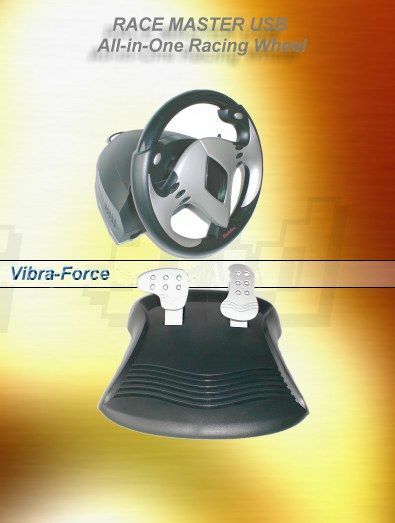 The Racingstar Vibra-Force Feedback Racing Wheel sets the new standard in USB vibra-force feedback racing wheels. Vibra-Force feedback technology provides a heightened level of realism and interactivity in racing games by letting gamers feel every bump Â‘onÂ’ or Â‘offÂ’ the road and the impact of hitting another car and crashing without the bruising and expensive hospital bills. Two wheel-mounted gear shifters let gamers keep their hands on the wheel while changing gears quickly, while eight fully-programmable buttons make for simplicity in controlling the horn, lights and other car functions. For those who like to put the Â‘pedal to the metal,Â’ the Racingstar offers realistic gas and brake pedals, a weighted pedals base and a non-slip textured floorboard. A dual clamping system holds the wheel base tight and secure Â– all thatÂ’s missing is the checkered flag and the pretty girls at the finish line. Manufacturer: USBGear USA Warranty: One Year In-stock? : Yes!